Advantages: Knowledgeable authors, wide variety of subject matter, colour profiles; industry news and reviews. Conclusion: This is the ideal magazine for those with any interest at all in WWI aviation. It provides articles from authors recognized in their fields and the diversity of material means that there’s something here to please everybody. 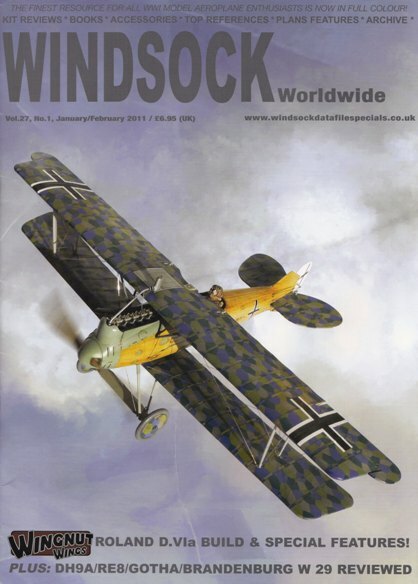 This year’s first issue of Windsock Worldwide has hit the desk and once again there is something for everybody. Lance Krieg returns with another instalment of his popular “Master Class” series. This time he looks at the various techniques used to manufacture wing and fuselage structures. Five pages are dedicated to this section and it’s complimented with over 40 colour photographs. Forming turtledecks, skinning a new set of wings, and even heat moulding new components are explained, all in an easy to understand text. Lovers of the Wingnut Wings range of kits will enjoy Ray Rimell’s build of the 1:32 scale Roland D.VIa. Plenty of hints and tips are offered in the narrative which is accompanied by 50 step-by-step illustrations. Additional to these 9 pages are a further 3 that provide close-up images of the sole survivor in Poland and a description of its unique construction. Ronny Bar contributes with 3 of his acclaimed pieces of artwork and these profiles of the Roland D.VIa are different from those in the aforementioned kit. The customary “Readers’ Gallery” displays the aircraft of avid Windsock readers and the usual comprehensive roundup of reviews completes the publication. This latter section is extended to cover the WNW DH9a, W29 and RE8, as well as Roden’s 1:48 scale US DH4 and the Blue Max/Freightdog Macchi M.5. Also included are the latest books, decals, tools and periodicals.